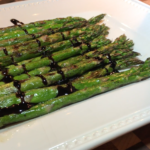 An easy recipe for grilled asparagus with balsamic vinegar drizzled on top. No need to make a reduction when using the Mia Bella Traditional Balsamic Vinegar. Asparagus can be roasted in the oven instead of grilled. Preheat oven to 450 degrees. Cook for 10-15 minutes.